From experience I knew that things do not exactly run on time in the islands, but I did not expect to get completely stood up by my guide. Fortunately, my hotel helped locate a “retired” guide who would take me out, and I figured that was better than stewing over missed fishing. When Abbie pulled up in his truck and trailer, I could not help but hear the “Sanford and Son” theme play in my mind. Trailering behind a very late model Chevy pick-up with dubious brakes was a fifteen foot Whaler that had seen some serious use. To give you a sense, the polling platform was a 2×4 spanning the gunwales and his pole was a twelve foot section on what looked like a closet hanging rod. We launched and quickly had major engine issues. Pulling over to some exposed coral, we proceeded to rip apart the lower unit in an effort to address the suspected cooling issue. After replacing a part in the water pump (Abbie’s friend/cousin showed up with the right part and wrench miraculously), we set off again. At this point I was extremely dubious about our potential for success, not to mention it was blowing about 20 knots and overcast. I could not have been more wrong. Over the next several hours, Abbie put me in front of one bonefish after another, deftly polling his boat into the most favorable position for me to make my casts. He coached me gently and we quickly became an adept team, spotting, casting, hooking and catching. We lost track of how many fish we hooked and landed that day, but I would conservatively estimate that we brought at least twenty to the boat and lost half as many to mangroves or busted tippet. All of the fish were in the 3 to 6 pound range and not at all shy about taking a variety of patterns. They all made blistering runs and gave me, my 7 weight Scott S3S and Bauer Rogue 3 a workout. Abbie’s truck broke down on the way back and we swapped trucks with one owned by another of his cousins, but by that time I could have cared less. I tipped him generously and Abbie and I agreed to meet for a half day charter later that week. It was even cloudier and windier when Abbie picked up me and my eight year old son, Jack, for our charter. He seemed surprised at first but quickly warmed up to Jack. Our launch was smooth and soon we were looking for fish. Within minutes we found a taker. After hooking the fish, I handed the rod to my son and started working with him to fight the fish. He quickly figured out when to reel and when to let the fish run and landed the fish within a few minutes. He was ecstatic. After a few more, he was fighting them like a pro. Unlike his father two days before, Jack didn’t lose a single fish. Eventually, he let me fight and land one but not before he started begging to cast the rod on his own. As our time ran short I relented. He deftly took the rod and made a short but straight blind cast to 10 o’clock. He stripped in some line and then looked at me and said his line was stuck. It was not stuck. 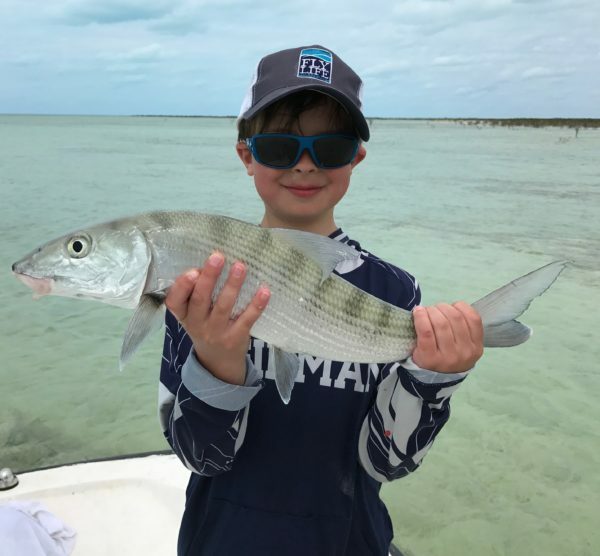 He had blind cast and hooked his first bonefish on his own. He proceeded to fight the fish perfectly and finished our day with a seventh fish landed out of seven hooked. Not bad for his first time on the flats. 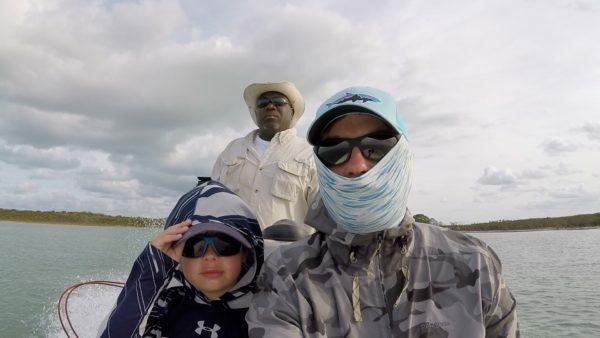 Once Abbie and I got over our astonishment, we shared a laugh and a cold Kalik and toasted my new bonefishing partner for his amazing work on the flats of Great Exuma.